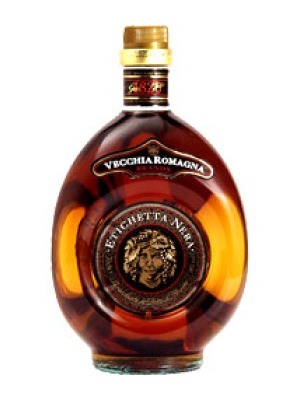 Vecchia Romagna Etichetta Nera Black Label Italian Brandy is a popular Brandy and Cognac available from TheDrinkShop in 70cl to buy online. Visit TheDrinkShop for the best price for 70cl of Vecchia Romagna Etichetta Nera Black Label Italian Brandy or compare prices on our other Brandy and Cognac products. Brandy obtained from the distillation of the Trebbiano grape. The distillate is aged for over three years in small oak casks. Colour: clear, light amber with warm shades. Palate: Lively smooth and harmonious. The techniques of distillation and ageing create a perfectly harmonious bouquet and smooth taste. The character and smoothness of this brandy make it a perfect after meal drink. Excellent with a good espresso coffee. Serving Temperature: it should be served at room temperature in a large brandy glass. Where to buy Vecchia Romagna Etichetta Nera Black Label Italian Brandy ? Vecchia Romagna Etichetta Nera Black Label Italian Brandy Supermarkets & Stockists. You can buy Vecchia Romagna Etichetta Nera Black Label Italian Brandy online in most retailers and find it in the Brandy and Cognac aisle in supermarkets but we found the best deals online for Vecchia Romagna Etichetta Nera Black Label Italian Brandy in TheDrinkShop, DrinkSupermarket.com, and others. Compare the current price of Vecchia Romagna Etichetta Nera Black Label Italian Brandy in 70cl size in the table of offers below. Simply click on the button to order Vecchia Romagna Etichetta Nera Black Label Italian Brandy online now.